Keeping the track of our health is a challenge. You cannot visit your doctor everyday to know the status of your health. You cannot keep nurses and health care experts around you all the time to take care of your health. How will you keep in touch with your health? these days all the people spend hours on their smart phones and here lies the solutions. There are some best free medical apps for android which you can download ob your devices and always be updated on the status of your health. These apps are extremely important and you must have them in your devices. This pap is for those who like to read medical stuff. Apart from professionals, any one can take advantage of this app because it provides updated medical news and advancements in the medical field. There are videos available on the medical procedures, you can search for specific topics, and there are articles and much more. You can also bookmark the pages to share them with your other friends or colleagues. This is a great Smartphone medical app for learners and medical professionals. 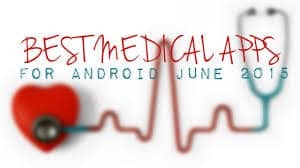 These days everyone looking for medical apps for android so here is the list compilation. This pap lets you have access to your medical records. You can have a quick glimpse of the vaccination you had, when you visited the doctor last time, which medication you are taking. you can also fix appointments with your doctors with the aid of this app. There are many features of this app and it can also send refill messages of your prescribed medication. This app is definitely going to help those who skip doctor’s appointments or refill their doses. It make own name on chart of best free medical apps for android. Accidents can happen anywhere and anytime. We do not know who is going to be the victim, but it is important that you know what to-do next. This app guides you step by step on how to deal with the situations such as heart attacks, accidents on the roads, natural disasters etc. you might not have idea about the worth of this app until you will get in any such situation. It is must to have among all the mobile medical applications. It offers easy learning about the things and how you can keep calm, cool in medical situations, and help others in saving their lives. This pap can save you from a visit to the optometrist. There are many exercises in this pap that can help you in training your eyes so that the brain processing can be improved. There are daily training sessions, which are basic workouts for your eyes. It is a great app that you must have because hours of sitting in front of the screens make our eyes poor and strained. This app can help you in taking care of the health of your eyes effectively. Hence it is one of the best free medical apps for android in playstore. Managing medications can be a real challenge, but tanks to this app. Here on this app you can curate the dosage and medication schedule. this pap also lets you share the symptoms and documents with your family doctors. You can schedule reminders, appointments and much more on this app. If you think that you need a doctor in your pocket, then this is among the best mobile healthcare applications that you can have in your mobile phones. Here you can look for a pediatrician, physician, and psychologists. Here you can find doctors in demand. This is one convenient app that lets you have easy access to the licensed professionals via audio chats, video chats. this way you can have treatment right at your home via professional consultancy because they can give you treatment based on your symptoms. You do not have to get out of your home. There are many other college health app and health apps available, which are free for the android users. If you are living alone or get easily confused at the time of medical emergencies, then these apps can show you the right path. You can use them and get treatments without the need of living your house. These apps are the best ones and you can instantly download them from the Google Play. Also, make sure that you suggest them to all your near and dear ones so that they can to get instant help in case of medical emergencies. Download best free medical apps for android.